I first really met David Morrison when I was convener of the SAAA Decathlon Championship at Coatbridge in the mid-70’s. When setting up the organising committee I was strongly advised to ask him to be the Field Events Referee. He had the advantage of living just along the road at Airdrie but that was not why he was recommended: he was a very good, experienced official with a personality that enabled him to get on well with the athletes as well as with the other officials. He filled the same post when I convened the next two decathlons at Grangemouth and then again in Coatbridge. We will comeback to his officiating but it is as a veteran runner that we will start the profile of this remarkable man. One of the Shettleston seniors at the time was Jimmy Flockhart who was the 1937 international cross-country champion and he proved a real inspiration to young David. His first National medal was won in the 1936 National Novice Championships over the Hamilton Racecourse trail. Unfortunately he lost the medal in the tram on the way home: he may have lost the medal, but he didn’t lose the pride in the achievement of leading the team home in 14th place. A year later he made the club team for the National Championship which won silver. After this race, Jimmy Flockhart gave him one of his own gold medals saying that he had run poorly and that the David’s team medal should have been for first place not second. That was his last national medal until he started running as a veteran athlete. The reference to Shettleston Harriers is significant. Having joined the club in 1933, he was still a club member when he died in 2006. He was one of a generation of men across the sport who believed in ‘one man, one club’. Loyalty mattered a great deal to all of them and Shettleston was blessed with a fine group of such men – David, Eddie Taylor, Willie Laing and others all started out as runners but believing that you do what your club needs you to do, they all turned their hand to coaching field events, to administration and to officiating. At the events mentioned above, David educated me in the ways of the decathlon. Two examples. First, I had been warned not to let the first day run on too long – the previous year it had gone on until after 7:00 pm and everyone was exhausted before the second day. So I pushed the athletes along from one event to the next until David came along and said quietly, away from everybody else, that ‘we’ were maybe rushing things and that the athletes needed some time between the individual competitions. I had forgotten about the needs of the athletes! Second, There were two pools for the high jump and for the pole vault. David took one look and said firmly that one landing area for the pole vault was unsatisfactory: there was no cover mat on the beds and any limb going between them could be really badly injured. The stewards setting the equipment out should have known that but I should have known to look. He had been the chief field event judge at the excellent 1970 Commonwealth Games and would go on to hold the same position at the 1986 Commonwealth Games. He judged and refereed at national and district championships, and even on the Highland Games circuit. Having started as a long jumper and having coached all the throws – hammer, discus and shot in particular- he was in an excellent position to officiate. 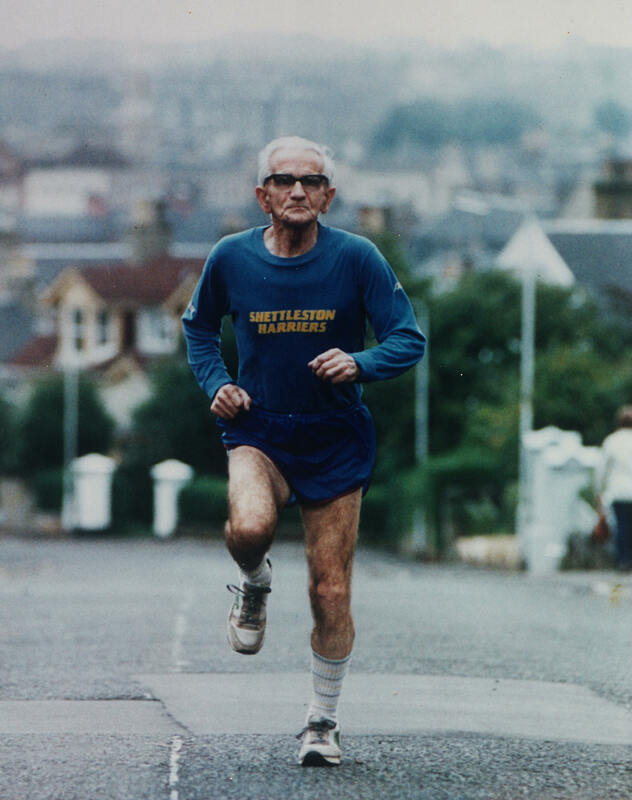 As an administrator and club official he was Honorary President of the Scottish Veteran Harriers Club from 1993 – 2006 having held various other posts including secretary, at Shettleston he was Treasurer from 1970 – 73, and from 1978 – 81. He was also President from 1949 – 51 and Honorary President in 2006. His sterling service to the sport was recognised by Scottish Athletics who made him an Honorary Life Member. Note that these are all time rankings as listed at 25/7/13.